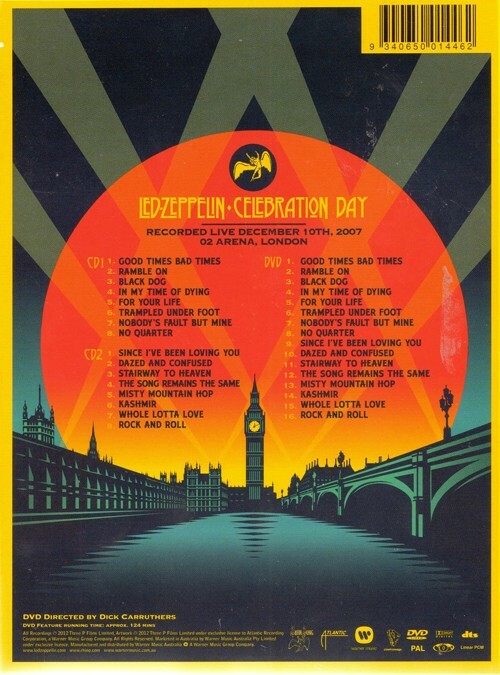 Buy, Rent or Skip Led Zeppelin: Celebration Day? Finally concert footage of the band I can enjoy. I've have not seen their box set or heard it. I couldn't stand their early outing The Song Remains The Same. Sadly though, I probably will not be picking this up. Why? Because the dickhead director f ucked it up with his MTV style editing. Good Gawd with the quick edits. It's just headache inducing. The closing song Rock and Roll, I just had to look away. It's not as horrible as some like Rush. But still the quick edits are fast enough here to frustrate the living f uck out me. This could have been it. The concert. The audio was amazing. Every player caught pristine clear... even at high volume. Robert Plan impressed me with his vocals. He is definitely laid back with a lower octave, but does not fail perform. But Plant can still scream nicely when he needs too. Jimmy Page was fun to watch. The dude can lean back while playing. John Paul Jones impressed the hell outta me. The dude plays keyboards and bass at the same time and he does it so well. Jason Bonham represents his dad well. Plays strongly and then some from what his dad laid down. The stage was massive. The audience was massive. Thank gawd they didn't bring them into the video too much. I read some of (ok, a lot of) reviews over on Amazon as I'm looking to pick this up for myself. A lot of people are slamming the editing of the show which leaves me somewhat concerned. One of the worst edit jobs ever appears on KISS Symphony and to this day I can't watch it as it induced Nausea, Vertigo and Tourette's syndrome on my part. I want to get this, but not if it's as bad as everyone is making it out to be. I suggest caution then. Replayability? I'm glad I got to see it, but due to the editing, I doubt I'd ever rewatch this. I keep checking on YouTube looking for samples of what the editing may look like. So far, no one has posted anything. It's obvious the director was editing to the song mimicking changes. You might find it acceptable... I can't. I guess it's more irritating on the big screen too. I'm only 10 ft away from my large screen and it becomes a strobe. Well good gawd, what Epileptic seizure inducing director put that together. Dude, anything compared to THAT is going to look good. Yes, the Zep editing is not nearly as quick as the Kiss, but IMO, it is still way to fast to get invested in. And what I mean is that you lose connection with the performance and the musicians. I think for some reason, these folks are equating quick edit visual with the beat of the song, or the energy on the stage. But who watches a concert like that? Movies quick edit to tell a story. A concert is one continuous flow with the spot light on individuals at any one time. My eyes are not dancing around the stage every second. Take a look at this recent concert footage of Chris Rea. Notice the flow. Notice how the camera holds onto Rea and the musicians and you get a sense of connection... of being there. This is an example of what I expect when watching a concert. No, I totally get where you're coming from. And to bring it full circle and back to Zep, the original bootleg of the O2 Concert that I posted at the beginning of Led Zeppelin Live is the way I prefer all my concerts to be. Just one stationary camera, one shot and no cuts of any kind. Another prime example and probably how all concerts should be shot is one that's considered very crude by today's standards. Hell, it was crude by 1973 standards. I'm speaking of course about KISS' Coventry Gig. It's AWESOME in its simplicity!!!! Agree, so I don't get why some concerts are filmed and edited so badly. I guess like movies, each director has a vision. ....each director has a vision. Yeah, if it's Tourette Vision. I have watched the bootleg of the same 02 Show plenty of times and it's one of my favorite bootlegs for a couple of reasons: the raw, uncompressed sound and the lack of edits. Being able to watch a show as seen in bootleg form is the closest thing to actually being their live in person. So I was very curious to see what Celebration Day would bring. Straight up, this is a concert film, which shows on the surface as it is shot on film, including 8mm for this quick little inserts that break up the film in places. 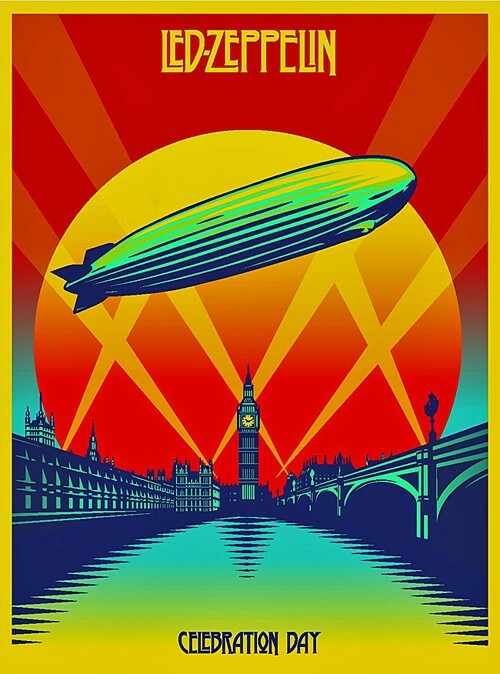 Not a bad idea either as it's paying homage to classic Zep era footage of the band from the 70's. Sonically this DVD is top shelf and one of the best sounding concerts you are ever going to get. The audio mix was practically perfect as each instrument was clear and precise. The highs and lows ring like a bell and thump you with the bottom bass. Good stuff. As mentioned earlier in Mac's review, there are a few spots where the excessive editing takes over and it has a lot to do with the song of choice that is determining where the cuts are being made. Personally, I don't think it's that bad, especially comparing to others (KISS Symphony). 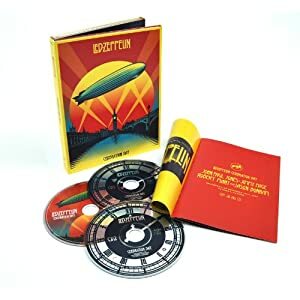 This DVD is an absolute must for any fan of Led Zeppelin and Rock fans. Buy this! But be forewarned, there are a few different packages and I was certain that my Library had the full deluxe edition with all the bonus stuff including band rehearsals. This one did not. It's a bare bones DVD with 2 CD's of the same show. I will be picking up the Deluxe Edition for sure. One last thing, how is it possible for a band to be at the top of their game 30 years after the fact? Simply amazing show. I didn't think it was possible, but I'm a bigger fan of John Paul Jones, Robert Plant, Jimmy Page and Jason Bonham because of this one-time Reunion show. And we are lucky to have this DVD to remember it by. Highlite of the show is of course Kashmir. It STILL gives me a thrill hearing that song.